CHARLOTTE AMALIE – For the eighth time in nine days, a minor earthquake has registered on the ocean floor off the coast of St. Thomas, according to the U.S. Geological Survey. The U.S. Geological Survey said the earthquake occurred at 10:33 a.m. yesterday and registered 2.5 in magnitude on the Richter scale. The quake occurred 17 miles north-northwest of Charlotte Amalie. Friday’s earthquake was 43 miles east-northeast of Fajardo in Puerto Rico; 53 miles east-northeast of Rio Grande, Puerto Rico and 58 miles east-northeast of Humacao in Puerto Rico, the U.S.G.S. said. On Thursday, an earthquake that was 2.9 in magnitude occurred at 2:37 p.m. about 37 miles north-northeast of Charlotte Amalie, according to the U.S.G.S. The U.S. Geological Survey said an earthquake occurred at 9:11 p.m. Wednesday and registered 2.5 in magnitude on the Richter scale. The quake occurred 63 miles to the northeast of Charlotte Amalie. The U.S.G.S. also said an earthquake 3.4 in magnitude happened at 9:56 a.m. Tuesday August 4 about 82 miles north of Charlotte Amalie. 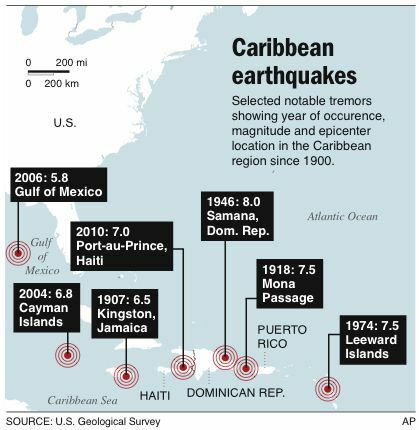 On Monday August 3, a quake registering 3.2 on the Richter scale occurred 60 miles east-northeast of Charlotte Amalie. The U.S. Geological Survey said there was an earthquake of 3.0 in scale on Sunday August 2 at 7:46 a.m. The quake was 46 miles to the north-northwest of Charlotte Amalie. An earthquake 3.0 in magnitude on the Richter scale also occurred 54 miles north of Charlotte Amalie at 10:16 p.m. Friday July 31, the U.S.G.S said. And on Thursday July 30 a quake measuring 3.4 in magnitude happened 66 miles north-northeast of Charlotte Amalie at 7:26 p.m.
St. Thomas also registered a 3.2 magnitude earthquake at 4:43 a.m. on July 23, according to the U.S.G.S. It was recorded to be three miles north of Charlotte Amalie. Six tremors were recorded off of the coast of Barbados July 16, according to the Caribbean Disaster Emergency Management Agency (CDEMA). The previous earthquakes that occurred off the coast of St. Thomas occurred on July 5 and July 8 only registered 2.7 in magnitude on the Richter scale, according to the U.S.G.S. The July 8 earthquake was 16 miles to the north-northeast of Charlotte Amalie and the July 5 earthquake occurred 43 miles north-northwest of St. Thomas, the U.S.G.S. said.